Joseph Aloysius Lyons (15 September 1879 – 7 April 1939) was the tenth Prime Minister of Australia, serving from January 1932 until his death. He had earlier served as Premier of Tasmania from 1923 to 1928, and was the first, and to date only, prime minister from Tasmania. Lyons was born in Stanley, Tasmania, and was a schoolteacher and trade unionist before entering politics. He was elected to the Tasmanian House of Assembly in 1909, representing the Labor Party, and became a government minister in 1914, under John Earle. Lyons was elected party leader after the Labor government’s defeat at the 1916 state election. He became premier in October 1923, after Walter Lee lost a no-confidence motion, and served until being defeated at the 1928 state election. He afterward entered federal politics. Elected to the Division of Wilmot at the 1929 federal election, Lyons was immediately made a minister in the new government formed by James Scullin. However, he resigned from cabinet in January 1931 over a policy dispute, and two months later left the party altogether. He and several other Labor defectors subsequently helped to form the new United Australia Party (UAP), which elected Lyons as its leader. The UAP won government at the 1931 federal election, and was re-elected in 1934 and 1937. 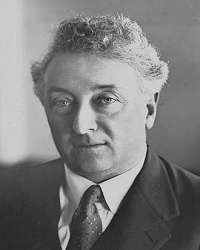 Lyons died of a heart attack in April 1939, becoming the first prime minister to die in office. His widow, Enid Lyons, later became the first woman elected to the House of Representatives. Please click here to read more. In March 1931 Joe Lyons left the ruling Labor Party. He joined the new United Australia Party and became prime minister in January 1932. Joe Lyons’s rapid transition from disaffected minister in the Scullin government to Prime Minister of Australia says much about the turbulent state of Australian politics during the Depression. After crossing the floor in parliament and automatically removing himself from the Labor Party, Lyons joined ranks with the opposition Nationalist Party and formed the United Australia Party – the predecessor of the conservative Liberal Party. This segment also highlights the role Dame Enid Lyons played in her husband’s success. This clip is interesting for telling a fascinating story without the use of moving image footage or re-creations. Instead, the filmmakers draw on newspaper clippings, cartoons, pamphlets and still photographs from the time as illustration. Roger Climpson effectively modulates his narration to add urgency and a sense of historical importance at key points in the story.